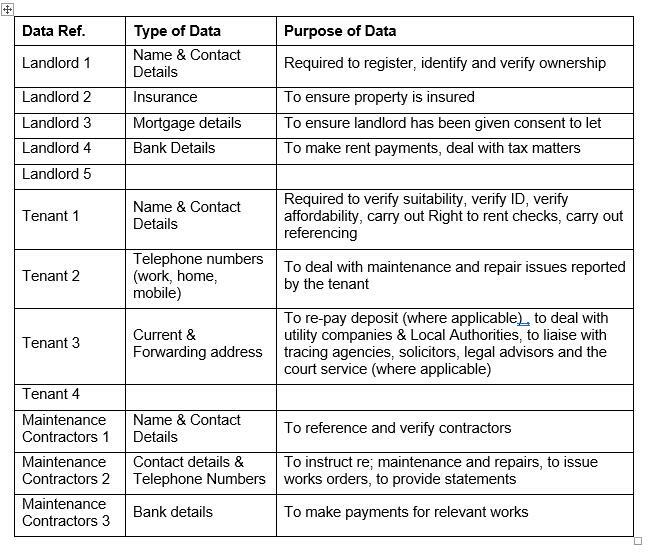 This Policy sets out the obligations of Alex Crown Lettings and Estate Agents a company registered in United Kingdom under number 8395831 whose registered office is at 708 Holloway Road London N19 3NL (“the Company”) regarding data protection and the rights of Landlords, Tenants, Consumers, Maintenance Contractors, (“data subjects”) in respect of their personal data under EU Regulation 2016/679 General Data Protection Regulation (“GDPR”). 5.3Data subjects are kept informed at all times of the purpose or purposes for which the Company uses their personal data. Please refer to Part 12 for more information on keeping data subjects informed. 7.2The accuracy of personal data shall be checked when it is collected and at regular intervals thereafter. If any personal data is found to be inaccurate or out-of-date, all reasonable steps will be taken without delay to amend or erase that data, as appropriate. 14.3In the event that any affected personal data has been disclosed to third parties, those parties shall be informed of any rectification that must be made to that personal data. 16.2In the event that any affected personal data has been disclosed to third parties, those parties shall be informed of the applicable restrictions on processing it (unless it is impossible or would require disproportionate effort to do so). 17.1 The Company processes personal data using automated means such as via software systems, email and other electronic methods. 20.1 The Company uses personal data for profiling purposes. <<Insert details of profiling activities>>. whether directly or via a third-party service such as the TPS. This Policy shall be deemed effective as of 15/05/2018, No part of this Policy shall have retroactive effect and shall thus apply only to matters occurring on or after this date.